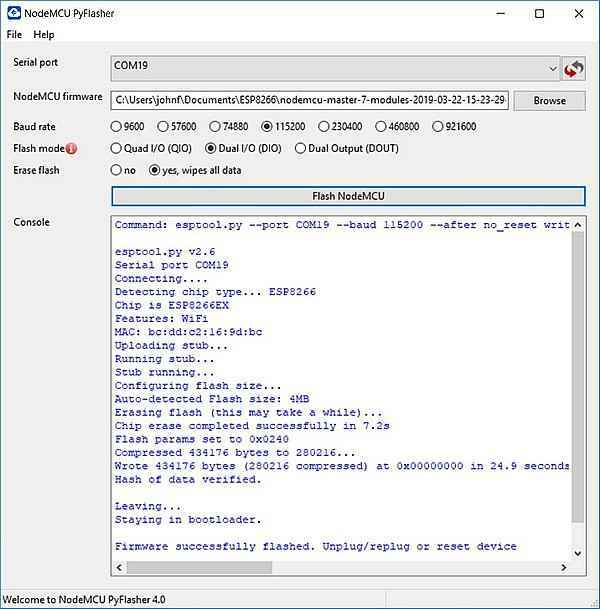 This Tutorial shows you how to flash the new nodeMCU firmware into a ESP8266. This is also useful to get back to the LUA interface if you were uploading C/C++sketches using the Arduino IDE - which overwrites nodeMCU lua data. This tutorial shows you how download and flash the latest version - since Feb 2019 some older library code has been deprecated - especially timer operation so its best to get going with the new code rather than learn outdated methods. This information allows you to switch between Lua scripting and Arduino IDE programming easily - just by reprogramming the ESP8266. installing Lua on an ESP8266 will allow you to use the LUA scripting language in an interactive terminal. This means code upload is far faster than the Arduino IDE compile-link-upload process. Although scripting languages are slower the processor is fast (which compensates for scripting speed) and you don't wait around for an upload as you do with the ESP8266 Arduino IDE - and Arduino IDE uploading takes about a minute so making small frequent changes is a pain. With scripting - its a few seconds and you're done. The only disadvantage is that its not C so you're going to have to learn a bit. The board used for experiments here is the Lolin NodeMCU V3 which has a very convenient USB interface that allows you to plug it into a PC - power is supplied from the USB port - but you will need up to 300mA~400mA (depending on the WiFi activity!) so don't use a hub, use a PC USB port or you might need an external power source. Note: Other boards such as the ESP-01 and those without a USB interface require you to keep GPIO0 low for programming. The Lolin nodeMCU board however has this pin controlled using outputs from the USB serial chip - so its all automatic - just plug in and flash the firmware. You can add an external power source to the Vin connection on the board with voltage >5V. Also connect ground labelled 'G' to complete the circuit. 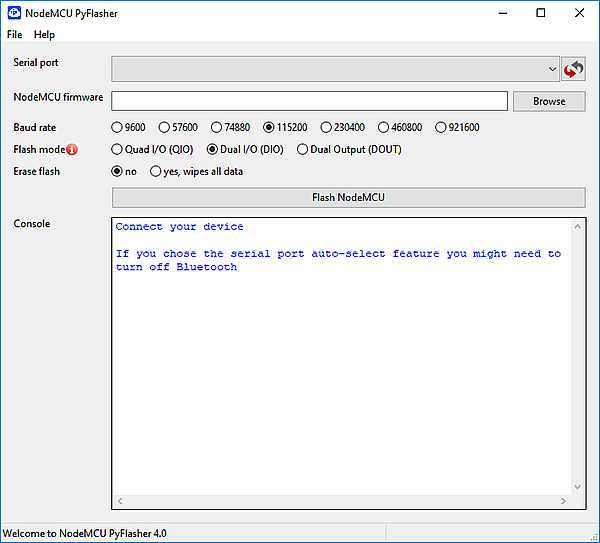 This method of flashing the ESP8266 to install the latest nodeMCU firmware uses the latest tool - which is also very easy to use, however you need to go and get a binary file for it to program into the chip - not too difficult. This will download the pyflasher that is python based but you won't need to install other files just double click and go. Before you can use pyflasher go and get a binary sent to your email account (for the default settings this takes ~2 minutes). It sounds a bit intimidating but the steps are easy - there's only a few and its not that hard. Note: You can see the functions available for each module by clicking on the book symbols next to each check box. 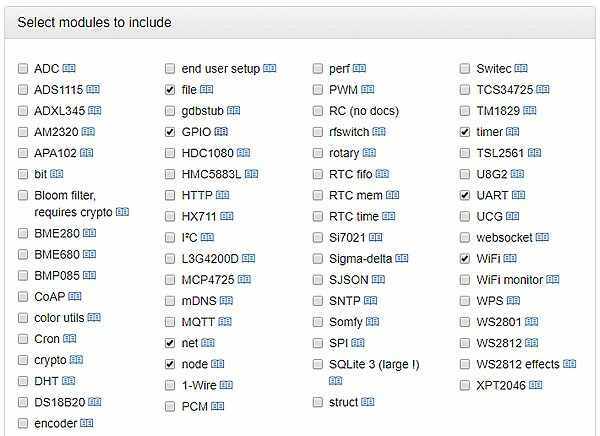 The idea is to include those you need since space is limited on the ESP8266. 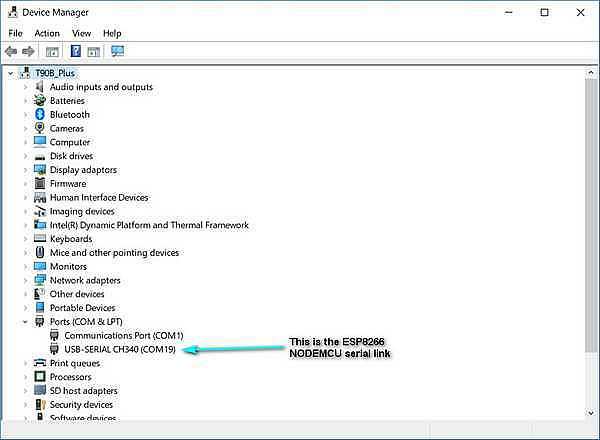 Again don't forget to close the ESP8266 serial port you may have been using! Download the float version of your binary - this is recommended even though it uses more memory but is up to you. Keep the serial speed at 115200. Choose the serial port or use auto detect. Choose Erase Flash - just to make sure! Note: When you start the serial terminal this Lua interface uses 115200 baud not the 9600 as the previous version used. Warning: The ESP8266 does not start immediately - When you first start it it will format the ESP8266 file system - takes about 40 seconds. The above screen is from the ESPlorer terminal. Note: this is all interactive - there was no compiling a C source file and waiting for upload. If you don't want to add an external LED use pin 4. Current schematics don't show it but I found it by accident. LED operation is inverted, for this pin, since it is pulled high so digital write low sets the LED on. Note: Some people do not use a resistor in series with the LED but that is relying on the max current from the nodeMCU as 12mA - other boards will allow more current out (and blow up the LED) so it is best practice to use a resistor - when you forget which board you are using! The usual case is to use a 330R resistor in a 5 volt system. In that case you get (5-2)/330=10mA. LEDs can usually take 20mA so choosing 10mA for a 3V system gives R= (3.3-2)/10e-3 129R so 120R would do. Connect an LED and resistor on a breadboard to D0. other end of resistor to Ground (G). You can see the LED turning on and off using the interactive Lua script interface. 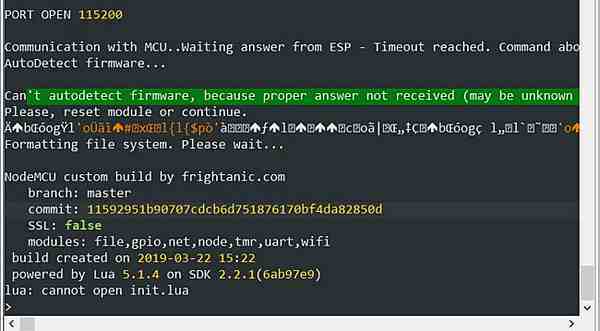 NEXT: Now you have updated the Firmware and Lua is working on your ESP module. The next thing to do is to install a Lua uploader/Editor. This makes it easy to upload files to the device, and program it over the serial connection. One popular uploader is ESPlorer.